Fun and agile twintip with surprising grip underfoot for a soft-flexing park and pipe model. Super easy to ski with a comfy pivot point when mounted at the factory mark. Great choice for all-mountain frontside use as long as you don't want an uber-floater or racing ski. Intermediates could ski this ski easily and probably up their game at the same time. Doesn't have hard-core pop and explosive rebound, but precise and controlled and remarkably quick edge-to-edge or smeared. Definitely soft, but not mushy. Responsive and fun in the bumps. Handsome (rather than circus-like) graphics. Easy to be lazy on, but responds immediately when pumped hard. Pretty stable at speed for a soft twin tip. Nice mix of capabilities. Palmer and Hansjürg Kessler (multi-time snowboard worldcup winner and design guru). This ski has nearly identical dimensions to the Lib-Tech NAS park and pipe ski (P03 is two millimeters wider in the tail). Full 360 degree wrapped edges. Very lightweight, very thin vertical profile, very soft and buttery feeling. Excellent fit and finish with great factory tune right out of the wrapper. Fairly damp feel...no severe snap to its rebound. First test day: Fresh 1-2 inch snow on top of very dense, very packed damp corn snow (barely leaves a footprint when stepped-on) with some hardpack in spots. I jumped on this ski immediately after riding is fatter brother, the P01 Freestyle 179cm and found it was remarkably quick underfoot and had a very impressive grip on harder surfaces, as long as it wasn't bulletproof. Given just centimeter of snow surface to hold onto, the P03 whipped turns left and right with ease. You could smear the ski or lay it on edge to mimick slalom turns; bang-bang-bang. Really easy to pivot as mounted, with pretty much equal balance and response fore and aft (this ski is symmetrical with identical tip and tail widths) making swing weight (which is low) nearly irrelevant to the rider. This ski falls into the "soft twintip" category (not like the stiffer Lib-Tech NAS park and pipe we also tested this year), which makes it easy on the user, but lacks the "kicking rebound" some people crave. This P&P ski is more precise and carve-capable, and is probably easier to ski all day than many other twintips. I could see smooth, technical riders liking this ski, while the brawnier, more muscle-oriented tricksters might want a beefier tool for their style. The famous Palmer sidecut design seems to allow this ski to make great turns at various speeds, extending its range of capabilities outside the park and pipe to all kinds of terrain on the mountain. Really fun, and I think they look cool with their gold-on-black graphics. Playful tawny cat capable of more moves than you might think, but always lands on its feet with grace, ready to do the next thing, indoors or out. Watch some park and pipe pros really put this ski through some gymnastics, then put some teenage freeriders on it and watch them dodge ski patrol all over the mountain as they "improvise" park and pipe equipment out of snowmaking pipes, fences and fallen trees. Spring conditions...firm and nearly frozen granular in the very early AM, then turned to dense packed "damp sand" and sinkable corn later on with scraped sections showing some softened ice underneath. 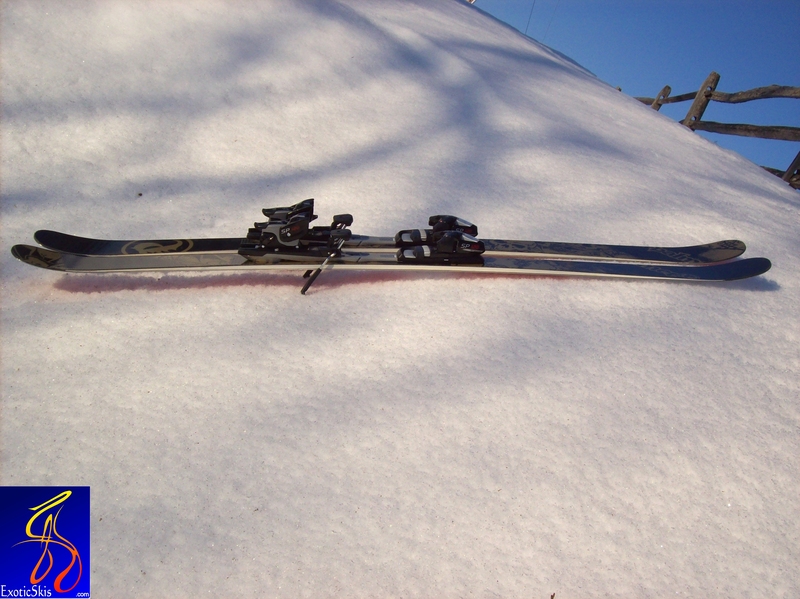 This little ski impressed me in the spring conditions by being extremely agile with very little effort. It takes zero effort to get it to change directions at any speed, even in the softening damp-sand / pre-corn snow. Quick little zig or zag to avoid a bump...no problem. Big direction change with a hop-spring to get over a rut...no problem. Arc a big trench in the soft stuff...fun. Remarkably grippy underfoot on the semi-softened ice and hardpack. I came away with the impression this would actually make a really decent all-mountain ski for many people. Unlike many "park and pipe" skis, the P03 has a very wide range of performance and surface types it likes. Very fun and sporty. Slightly narrow underfoot in the really soft spring snow, but that's to be expected. Kicks up a nice roostertail of spray in the corn too. 7.5 for the terrain park (and the groomers and powder that one passes through on his way there). The Palmer P03 skis are incredibly light and buttery, allowing for quick jump turns in crusty east coast powder, smooth carving down groomers, and technical presses and switch ups/spins on rails. 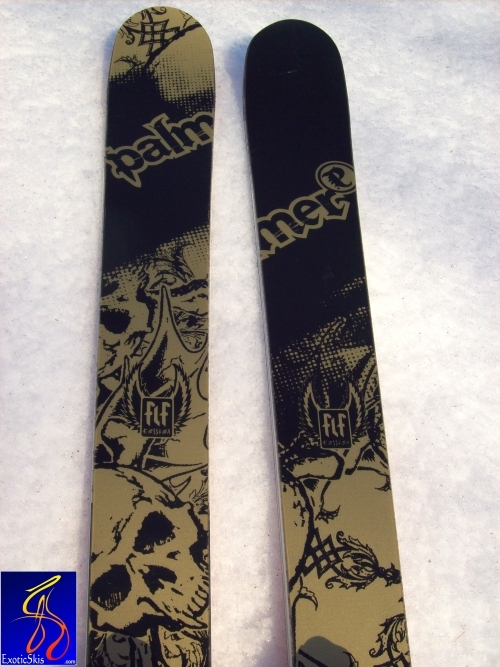 However, if you are a rider who lives for jumps and halfpipe, the flexible Palmer skis are unforgiving and unwilling to save you from skidding out on a landing. I would not recommend these skis for someone who is serious about hitting large jumps and throwing tricks (If you are not sure if you fall in this category, you probably don't). For my own preferences (constant rails, powder in glades, and carving switch turns down groomers), the PO3 meets my expectations with distinction. 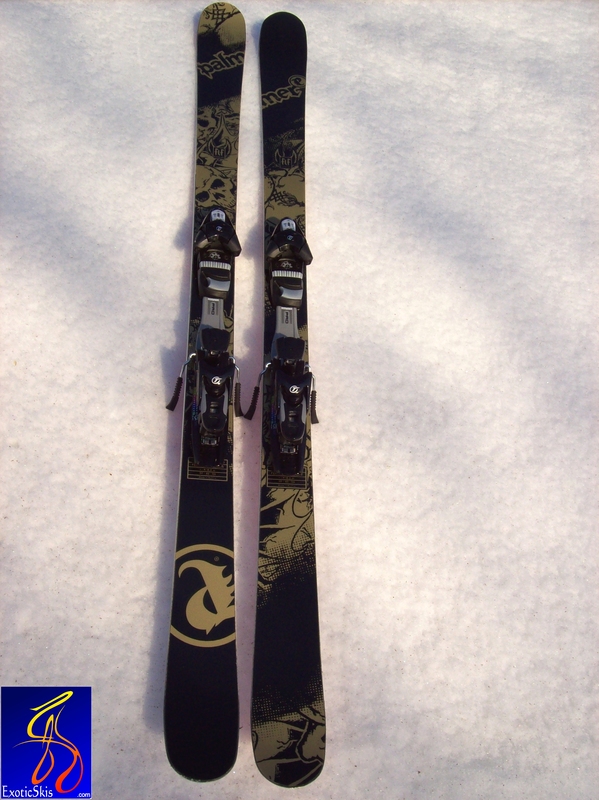 I rode these skis for two days, lapping the Killington, Vermont terrain park continuously each day. Surprisingly, I found my comfort level on rails was just as high with the Palmers as it is with my Line Afterbangs ( a pure jib ski). They are playful, lightweight, and reliable. Incredibly lightweight, smooth black and gold appearance, responsive buttery yet snappy construction, and a lack of stability for jumps. The ski is light and responsive, and is sure to be adored by pure jib skiers who also bomb around the mountain when they need a break from the terrain park. The P03 handles powder as well as any soft all mountain ski will: sufficiently for limited powder conditions, but disappointing for repeated powder use. Carving is fun and reliable, but is limited to giant slalom turns and becomes a bit scary at high speeds with such a buttery ski. The little brother who has been bullied enough to accept his place is inferior in strength and size, but, as a result, has excelled in the niche he has been able to occupy, learning to maneuver technically in sticky situations, remain light on his feet, and respond to changing conditions sufficiently. Strap them back on my feet so that I can fully experience their comfort on a variety of rails, using their light weight and responsiveness to whip a few 360 switch ups on a down-flat down rail. Later in the day, I would thread through some tight glades, watching my buds fall hopelessly behind as they are unable to manuever through the transition from fluffy powder to crusty sheetrock through the woods. Afterwards, I would butter off the landing of some jumps, scared of throwing anything substantial of the actual jumps. 6' 0", 180 lbs. Expert rail skier and hardened east coast kid. Began racing, realized it's insufficiencies, and moved to newschool skiing 3 years ago. 14 years experience as a skier, and 3 years experience as a newschooler, dedicated to jibbing everything in sight.